Are you looking for easy appetizers for a crowd this holiday season? I’ve got them! These make your own appetizers are perfect for a party. 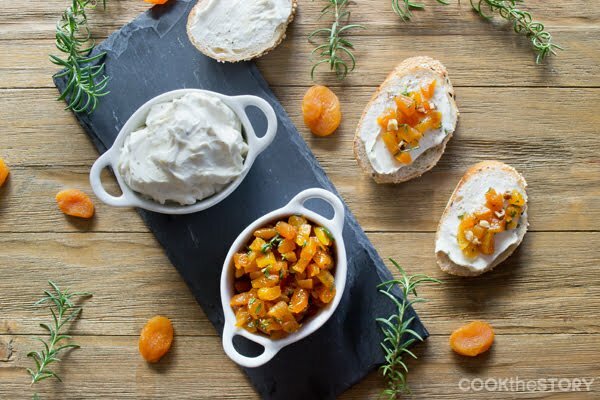 You put out some baguette slices and crackers, a dish with Lemon Pepper Cream Cheese and another with Rosemary Maple Dried Apricots. Your guests then build their own little canapés from the ingredients. Fun, right? Back in the spring I did a series of posts with canapés recipes. So many tasty snacks! I loved eating every single one. But I less-than-loved making them. Don’t get me wrong, they were pretty simple. But it was tedious to make all those individual servings. I certainly couldn’t have done it for the big Holiday Party we had this weekend. That’s why I came up with this riff on the apricot canapé I shared in March. That one had a dried apricot for the base. 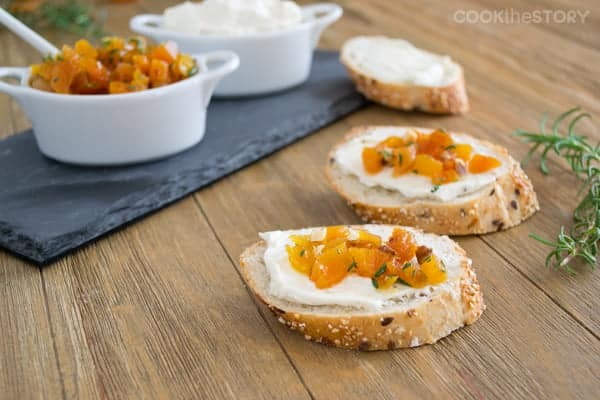 The apricot was topped with a goat cheese and almond spread and then a couple of rosemary leaves. The flavors were outstanding. For these easy appetizers, I put out some sliced baguette and crackers for bases. Then I put out a Lemon Pepper Cream Cheese spread in a nice little dish and some Chopped Dried Apricots with Maple and Rosemary in another. 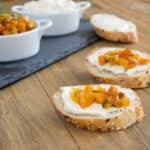 Our friends were then able to build their own canapés by spreading some cream cheese on the bread and then topping it with the apricots. Here are the recipes you’ll need for these easy appetizers for a crowd. The first is for the Lemon Pepper Cream Cheese that your guests will spread on bread. The second is for the Apricots with Rosemary and Maple that they will put on top of the spread. This topping made of dried apricots has such a delicious and intriguing flavor. 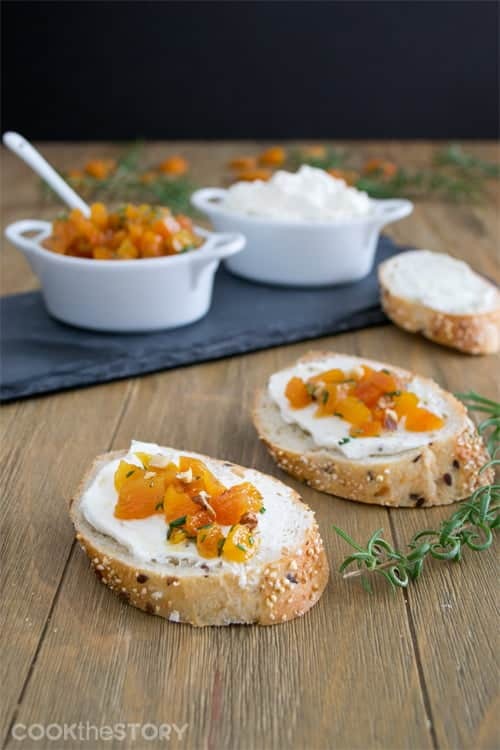 The sweet apricots with sweet maple turn a bit savory with fresh rosemary and walnuts. Paired with lemon cream cheese, it really is a lovely flavor combination. Add cream cheese spread ingredients to a bowl and stir to combine. Add topping ingredients to a bowl and stir to combine. Place bowls out with baguette slices and instruct your guests to create their own canapes.